American author, activist, and civil rights leader. Wife of Martin Luther King, Jr.
Freedom is never really won. You earn it and win it in every generation. That is what we have not taught young people, or older ones for that matter. You do not finally win a state of freedom that is protected forever. It doesn't work that way. 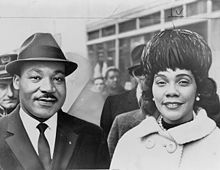 Coretta Scott King (27 April 1927 – 31 January 2006) was a civil rights activist, author, and wife of Martin Luther King, Jr.. Mother of Yolanda Denise King, Martin Luther King III, Dexter Scott King and Bernice King. No abundance of material goods can compensate for the death of individuality and personal creativity. I believe that freedom and justice cannot be parceled out in pieces to suit political convenience. On April 3, 1968, just before he was killed, Martin delivered his last public address. In it he spoke of the visit he and I made to Israel. Moreover, he spoke to us about his vision of the Promised Land, a land of justice and equality, brotherhood and peace. Martin dedicated his life to the goals of peace and unity among all peoples, and perhaps nowhere in the world is there a greater appreciation of the desirability and necessity of peace than in Israel. Coretta Scott King not only secured her husband's legacy, she built her own … Having loved a leader, she became a leader, and when she spoke, Americans listened closely.